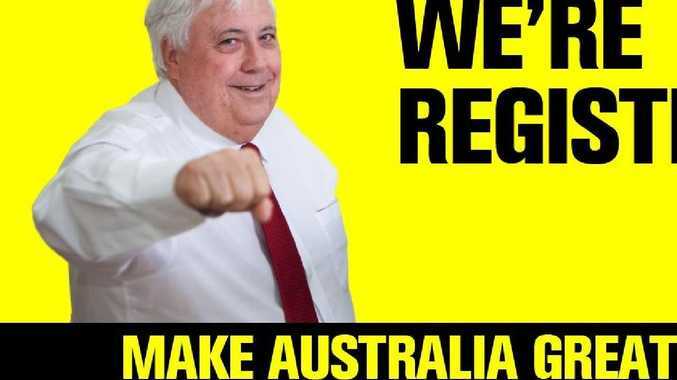 Clive Palmer has made a splash with a number of bold claims and noisy ads since last year. CLIVE Palmer has sent Australians an alarming text telling them their "freedom is under threat". Mr Palmer has been spending millions of dollars on costly television advertisements, text message spam, billboards and a bizarre online game called The Humble Meme Merchant. "Your freedom is under threat," today's text reads, urging recipients to "watch Channel 9 between 7.20-7.35pm … for an important 2-minute announcement". 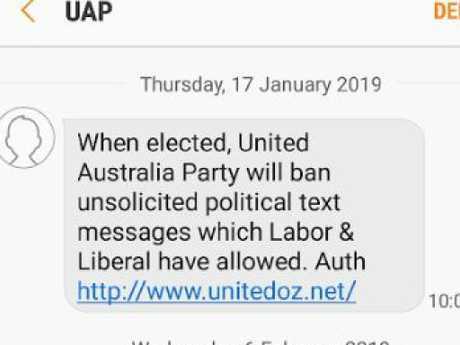 It remains unclear what the threat is, or what the announcement will be, or why the United Australia Party is texting anyone anything. Complaints following the latest mass text have been resounding. One Twitter user said she initially mistook the alarming text to be from the State Emergency Service. Mr Palmer and the UAP have declined news.com.au's requests for comment. CAN YOU BLOCK TEXTS FROM CLIVE PALMER? How do you block messages from Mr Palmer and the UAP? Unfortunately, at this stage that seems impossible. And being unable to block unsolicited political messages from Mr Palmer is one of the irritating strategies he's using to try and to win votes. Australians were today surprised to find this alarming message telling them their security was "under threat." One Twitter user reported that even after blocking the UAP number they were receiving the texts from, the messages have continued to arrive. "Has anyone successfully blocked text messages from that self indulgent tw** Clive Palmer?" they asked. "Every time I do it, he seems to change the number he's texting from, and no amount of writing STOP as a reply seems to work." The UAP website was down this afternoon, consistent with it being overloaded from too many visits. The phone was also either engaged or off the hook when news.com.au called numerous times. But for those Australians interested in finding policy information from the party website, there is little to be learned from logging on. The UAP site doesn't seem to have updated its national policy page since the last election. What is much more regularly updated is The UAP's various Twitter accounts, which posts the odd TV ad, Twitter threads that double as articles and policy announcements, and memes that don't always use the meme format correctly. The site does list three former Prime Ministers from the 1930s and 1940s, including Sir Robert Menzies and Joseph Lyons, with their biographical information from Wikipedia. The family members of Sir Menzies and Mr Lyons have publicly disavowed Mr Palmer. Mr Lyons' great granddaughter told SBS and her family were "appalled that he's done this". Mr Palmer is currently in a legal dispute with mining company Citic, to whom he leases land in Western Australia. He contends the Chinese state owned firm owe him hundreds of millions of dollars in payments for land clean up; while Citic are trying to force Mr Palmer to make more land available for mining at the site at Cape Preston. Mr Palmer has said if the WA government intervenes in his high court battle and rules against him, he will sue for compensation. This could cost taxpayers $45 billion, according to Mr Palmer. As part of the complex international legal strategy, Mr Palmer moved his business and office overseas. 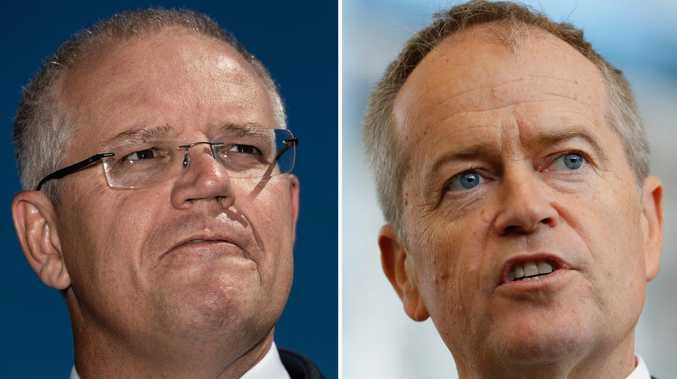 The leader of the UAP Party has previously dismissed suggestions that shifting control of his business to overseas businesses goes against a policy based on the slogan "Make Australia great".